The Journey Between is a dynamic dance work from choreographer and dance practitioner Chris Pavia. The piece explores how humanity connects and disconnects, a relationship that has long been signified in mythology surrounding the movement of the planets. 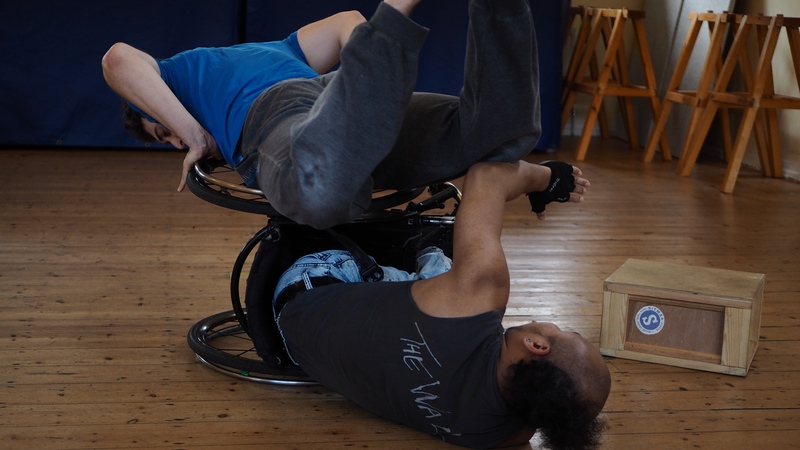 In The Journey Between, two cosmic entities, Jupiter and Mars, embodied by wheelchair dancer Nadenh Poan and non-disabled dancer Christian Brinklow, search for each other through space. The 20-minute piece is accompanied by immersive digital projection created by learning disabled artists from the Brighton-based agency Carousel. This collaboration results in a visually stunning work to tour with Stopgap’s dance film called Artificial Things, in which Chris stars as a performer.